The 5 Freedoms are reflected in our mission statement as well as in our standard policies for rescue, care, rehabilitation, and adoption in that they recognize both the mental and physical needs of donkeys. For example, we never keep a donkey without donkey companionship unless, which is sometimes the case, that specific donkey actually prefers or equally embraces the company of horses or mules, in which case he is accommodated accordingly. Nor do we tolerate bullying behavior among animals but make sure, as far as we can, that each donkey can live in an environment suitable to his personality and specific needs, free of stress and fear, and conducive to the enrichment of his mental faculties. The Longears Safehouse was incorporated as a NM non-profit organization on September 5, 2012, at first under the name of Edgewood Longears Safehouse. We later changed our name to the current one so that it would be less location-oriented. We are a registered charity with the NM Attorney General and the NM Secretary of State. We currently have four directors and are looking to obtain a property within NM to set up our main donkey rescue facility. In the meantime we are working with various foster locations mostly in the rural Santa Fe/Albuquerque areas to continue rehabilitating and rehoming the donkeys currently in our care. Our office is located at 37 Eastwind Lane, Edgewood, NM 87015. Since our humble early beginnings in the summer of 2011 we have helped more than 200 donkeys from New Mexico, Colorado, Texas and Arizona to find a safe place, in most cases a permanent loving home. Most of these donkeys required gentling, training, and a certain period of adjustment before they became able to trust humans. A fair number of them needed an extended period of physical or mental healing from the consequences of poor handing, mismanagement, neglect and/or abuse. The reason we call ourselves a safe house rather than a sanctuary is that, unlike many other worthy institutions we do not aim to provide a permanent home—a sanctuary, if you will—for most of the donkeys we help. Rather, we work primarily with private foster or adoptive homes, where our donkeys can get the focused attention and bonding that they deserve. We believe that most donkeys will be happier, after receiving appropriate training and socialization, in an environment in which they can bond closely both with other donkeys and their human caretakers. 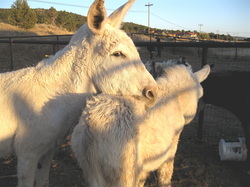 This is why we primarily seek private adoptive homes, where each donkey receives frequent one-on-one (or one-on-two) quality time with their humans, rather than places in large sanctuaries, where there is likely not enough staff to give the animals the level of long-term bonding and attention that they can get in a private home. Thus, while in the earlier years we did rehome some donkeys to qualified sanctuaries or other rescues if the situation was appropriate for such a move, we prefer to find them a private home setting.